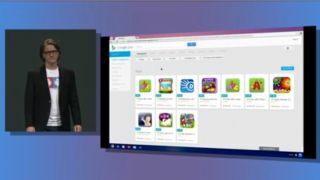 Android Engineering Director Chris Yerga returned to the stage during the Google IO keynote today to unveil Google Play for Education. The new Google Play service was "built from the ground up" for educators and provides tools for them to practically engage students using Android technology. Google Play for Education is a specialized app store with content designed for students and teachers. Educators will be able to easily send apps to all their students at once, purchasing bulk licenses on schools' dimes. Google Play for Education will launch in the fall, but developers can begin submitting education apps immediately at through a dedicated developer website. Classrooms have typically been the domain of Apple, but Google is no doubt hoping to take a bite with Google Play for Education. Google aims to put Android tablets in the hands of students and teachers, and the custom, curated app selection in Google Play for Education could prove a huge draw for tech-savvy schools. Google today kicked off its three-day Google IO conference in San Francisco with several key announcements. Google senior vice president Vic Gundotra took the stage to kick things off at the sixth annual Google I/O conference. He revealed that over 1 million were watching the keynote live on Youtube alone. Google also announced its new subscription music service Google Play Music All Access, its own version of the Samsung Galaxy S4, Google Play game services and more. Stay tuned to TechRadar over the coming days for more Google IO coverage.